Yesterday I wrote about the Pac-12 POY race. I introduced some new names and addressed the progress of some of the serious contenders. I even explained why a few guys would have great years but won’t win the award. Jahii Carson is going to win the Pac-12 POY award. Now I’ve already once mentioned hyperbole and I already made a prediction that he’d be the POY. We’re just 170 words into this party and that’s already transpired. But Carson is doing it. Doing everything. And on Monday night he did it again, leading ASU to their first win over a ranked opponent since January 8, 2010. One week after that win, in Tempe, I’d run my best Half-Marathon: 1:37:22. There’s no correlation between the two events, but note it has been a long time since ASU beat a ranked opponent. You guys, I know Herb’s weird but that’s him doing what can only be described as a variation of the dirty bird – perhaps the unkempt fowl? – after a November win. November, not March. A home November win against a team that scored 35 points in a 40 minute basketball game. Carson has people wildly excited about a program that’s had their coach on the hot seat for 2.5 years. As mentioned, it was the Devils’ first victory over a ranked opponent in 1418 days and even Buzz Williams might dance to that (though I doubt it). 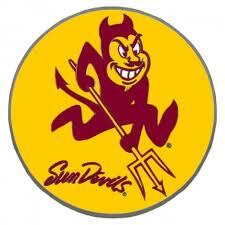 But before we wrap this party, I’ll advocate for the Devil momentarily (I realize the irony in using that idiom here as any article that talks about how great an ASU student-athlete is intrinsically advocating for the Devil), he hasn’t won the big game just yet. He and the Devils have won just one top-25 game with the opportunity to do it again on Thursday. I’ll be paying attention if I’m not in a turkey and pie coma. And everyone else should be, too. Maybe it’s the holiday hyperbole, but Jahii Carson is your Pac-12 POY. With the regular season now wrapped and the Pac-12′s seniors having played their final home games, we’re taking a tour across the conference and bidding this group of seniors farewell. David Bowers is a freelance writer and general expert on the sporting scene across the state of Arizona. His work can be found on his own blog, DavidABowers.com and as a featured columnist at Bleacher Report and Best College Tailgate. Carrick Felix entered his senior season with something to prove. The hometown product from Millennium High School in Goodyear, Ariz., just west of Phoenix was not recruited to play Division I basketball after averaging 19.7 points and 13 rebounds per game in his high school career. He signed with the College of Southern Idaho in 2008 and received a medical redshirt in his first season. The 2009-10 season saw Felix average 14.8 points and 4.7 rebounds per game at Southern Idaho and earned him a spot on the Sun Devils roster after the departure of standouts James Harden and Jeff Pendergraph. Felix struggled to make an impact in the 2010-11 season, seeing action in 30 games, but only getting the start in eight. He averaged a mere 4.6 points and 1.5 rebounds per game. He shot a paltry 39-percent from the field and 20-percent from beyond the arc. The Sun Devils won 22 games that year but lost in the first round of the NIT, an embarrassing end to a promising season. The 2011-12 season was an outright disaster for the Sun Devils. Their record of 10-21 was one of the worst in a long time and Carrick Felix was the second-leading scorer behind Trent Lockett. 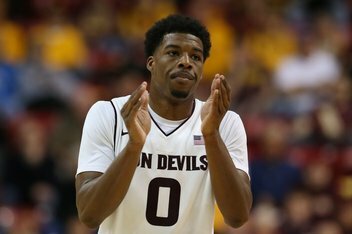 Felix’s 10.5 points and four boards per game were an improvement, but nowhere near what head coach Herb Sendek had hoped to see in the junior wing that started all but two games. Felix graduated with a B.S. in Communications in the spring of 2012 and was accepted into the Master’s of Liberal Studies program in the summer. 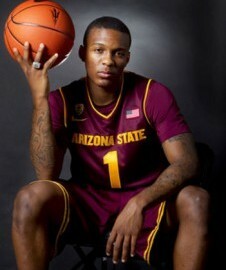 Heading into the 2012-13 season, there was a new attitude or swagger in Tempe. The freshman phenom, Jahii Carson was academically cleared to play and there were two new assistant coaches with NBA pedigrees in Eric Musselman and Larry Greer on the sidelines. In two seasons at Arizona State, Felix averaged 7.5 points and 2.8 rebounds per game. He shot 41-percent from the field and 28-percent from three-point territory. He also had zero career double-doubles, this season, he recorded three in a one-week span. After the 2012-13 regular season, he led the Pac-12 with 12 double-doubles and nine in-conference. His 14.2 points and 8.2 rebounds combo per game are second best in the Pac-12 behind Stanford’s Dwight Powell with 15.6 points and 8.8 boards. Felix finished the season in the top 15 of six categories in the Pac-12 including No. 6 in steals and No. 7 in rebounds. His field-goal percentage jumped to 51-percent and his 3-point shooting improved to 36-percent. He started all 31 games and led the Devils in field goal percentage, three-point percentage, rebounds and steals. His 14.2 points and 34 blocks were second best on the team as well. He scored in double digits in 25 games this season and 20 or more in seven games including 22 in his final regular season game against rival Arizona. The numbers are astounding and Felix was named to the second team All-Pac-12 as well as the exclusive Pac-12 All-Defense team with teammate Jordan Bachynski. The 6’6”, 196 lb. guard/forward had a bumpy road to begin his college basketball career, but he peaked at the best time possible. If Felix does not get picked up in the 2013 NBA Draft, he has the talent and skill to play in Europe or the D-League to prove that he can play for the NBA and I am sure wherever he goes will be better that southern Idaho.